Inspector blogging: Instinct, luck and who knows what? I still don't know why this officer crawled to the edge of a very unstable cliff at this exact spot. Judging from last time we spoke nor did he. However I am so grateful he did, despite our “conversation” about staying safe as he was allocated this job. This is the resultant recommendation for a Chief Constable's Commendation, written some months ago and awarded this May. "During a search for a lady who was in her 80s and considered to be at high risk of coming to harm, the actions taken by this officer showed initiative, bravery and ultimately saved the lady’s life. The lady lived at home with her son; a man in his fifties and a chronic alcoholic. A third party called the police with concerns after a garbled and worrying message from the son. When police arrived it was immediately apparent that the lady was missing. It was a cold, drizzly night with mist, thick cloud cover and strong winds. The lady was assessed as being at high risk. Extensive searches and enquiries were completed around their home and likely locations, but throughout the son continued to be unable to talk coherently with police or give a meaningful account. At the first opportunity in the morning this officer went to the address to talk again with the son. With intelligent and thoughtful questioning of a still challenging individual the officer managed to piece together an account of the previous day. He gleaned that the lady was intent on taking her own life. 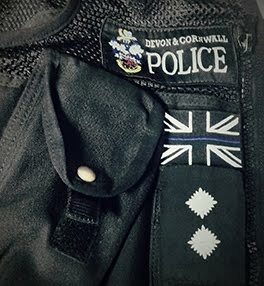 In amongst the rambling and random account of where the son “thought” his mother had gone, the officer caught a passing comment that she once threatened to jump from cliffs along a section of the coast path known to the officer. With no better lead the officer went to these cliffs and made his way along the coast path. It is a rugged coastal path with unstable overhangs and small bays where landslides are common. Conditions remained challenging with rain, low cloud, brisk winds and continuing cold weather. From the path you cannot see over the edge. Still not sure if the lady had come to this location, and with no other help immediately available the officer decided to go outside of the safety fencing to check places where he felt the lady could have jumped. In a small bay where the officer knew the soil and plants overhang a dangerous cliff of 80 feet, he approached the cliff edge on his hands and knees. By this time thoroughly wet and muddy, he managed to get close enough to peer over the edge and see below. On a ledge roughly 40 feet down the cliff he saw what he described as ‘a bin bag or a pile of something black’. Rather than ignore what seemed to be a small pile of flotsam he decided to shout out the ladies name against the wind. He saw movement and a hand poked out of the black bundle and waved. It was impossible to climb down from the overhanging shrubs the officer was lying on, so he called for assistance and made his way back to the nearest route he could find down to the beach. Once there he was about 100 yards from where he thought the lady was. The way there was underwater with a high tide and a choppy sea state of 4 or 5. The only way to get to the stranded lady was to wade through the surf of breaking waves up to waist height with the constant risk of losing his footing. At what he judged to be the right place he started to climb a difficult sloping cliff face up to the lady. He again caught sight of her and made his way to her, joining her on the ledge she had been on for over 18 hours and overnight. She was hypothermic, badly bruised and had cut her leg exposing the bone. He reassured her, treated her badly cut leg and warmed her as best he could using his coat and body warmth. He remained calm, controlled and stabilised the casualty whilst providing sufficient information to arrange a helicopter winch rescue. He put himself at considerable risk on more than one occasion during this adventure and was on the ledge for nearly two hours. please drive carefully, try to be kind to each other and don’t mess with stuff that isn’t yours.